We have examined a single specimen from sub-Antarctic waters that could represent a new taxon, but insufficient information is available to resolve this problem. Although no tentacle is attached, the two tentacles were found in the catch. with slightly toothed arm suckers. Arm suckers with distinct but somewhat variable dentition on distal margin of sucker rings. Scanning electron micrographs of the club suckers and enlarged views of the arm suckers can be seen here. Beaks. A description of the beaks (2D) can be found here. Funnel component of the locking apparatus is flask-shaped with a rather wide anterior stem and an elongate posterior bulb. Figure. Funnel locking-apparatus of Mg. "type beta". Left - Frontal of funnel component. Middle - Frontal view of mantle component. Right - Side view of Mantle component. Photographs by R. Young. No trace of chromatophores or photophores was found. Figure. 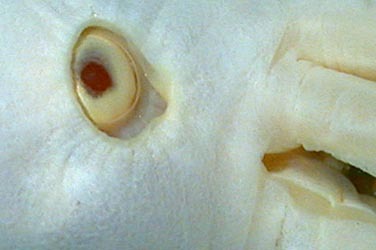 Lateral view of the head of Mg. "type beta", showing the apparent absence of chromatophores. Compare this photograph with the title photograph which shows what appears to be epithelial pigmentation around the eye. Photograph by R. Young. Additional details of the description can be seen here. The shape of the funnel locking-apparatus is similar to that of Mg. microlucens. The beaks show features intermediate between Mg. magna and Mg. microlucens. The absence of chromatophores, if real, is unique. Arm sucker dentition is present but slightly different from that of Mg. microlucens, but more specimens are needed to determine if this difference is typical. The single specimen was captured in subantarctic waters of the South Pacific at 47°S, 168°W. Page: Tree of Life Magnoteuthis type beta. Authored by Richard E. Young and Michael Vecchione. The TEXT of this page is licensed under the Creative Commons Attribution-NonCommercial License - Version 3.0. Note that images and other media featured on this page are each governed by their own license, and they may or may not be available for reuse. Click on an image or a media link to access the media data window, which provides the relevant licensing information. For the general terms and conditions of ToL material reuse and redistribution, please see the Tree of Life Copyright Policies.